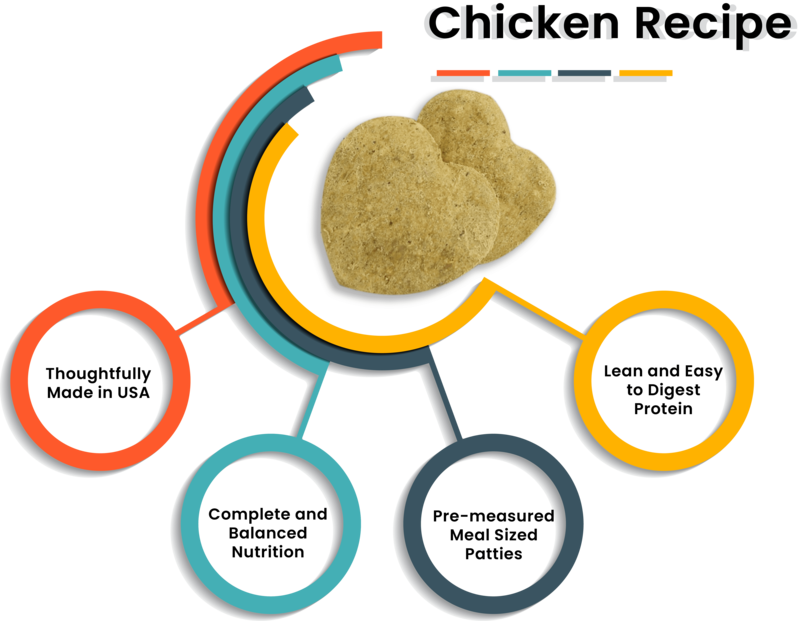 Raw Naturals Fresh to Home Chicken Recipe is packed with lean protein, antioxidants and essential acids. We put in everything dogs need, and leave out everything they don’t. Grain free, gluten free, soy free and free from artificial flavorings. With chicken as the single protein source, this food is perfect for dogs with allergies or sensitivities. This recipe is available in Small (32 patties), Medium (16 patties) and Large (8 patties). 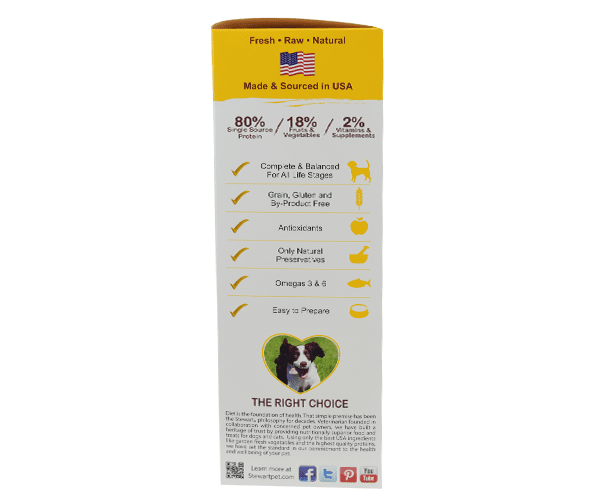 Freeze dried to be lightweight, wholesome and shelf stable, our chicken dog food patties are easy to feed, right out of the box. Use the patty alone, as a topper or a delicious layer in the bowl. Choose patties in small, medium or large to get all the goodness of our fresh, freeze dried chicken dog food in a super convenient form. 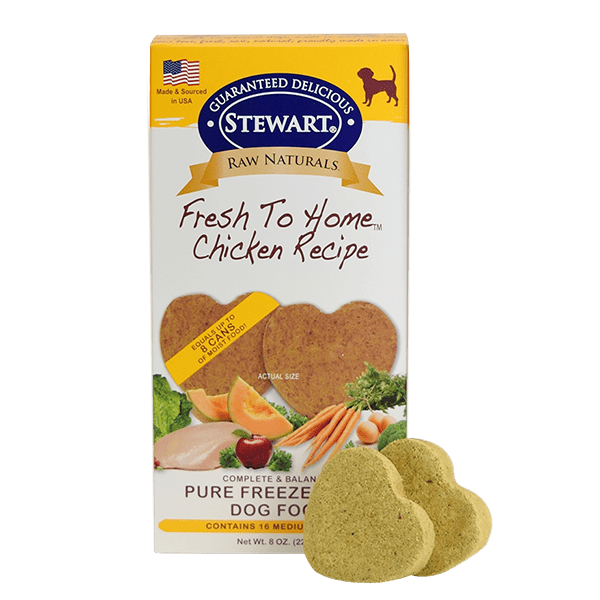 All Stewart Raw Naturals freeze dried chicken dog food patties are made in the USA with local ingredients. Antibiotic-free poultry is the patties’ #1 ingredient. 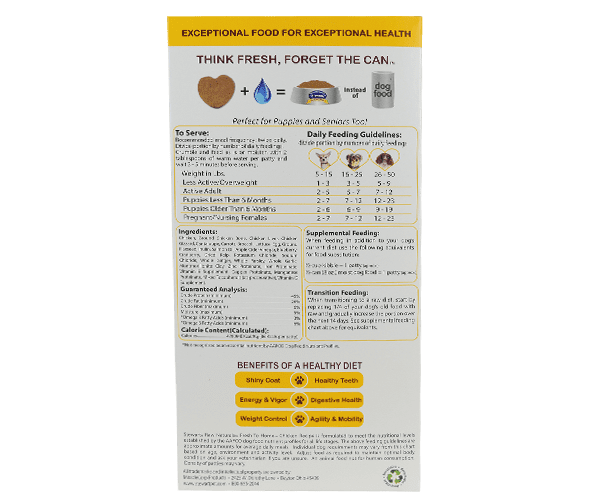 All-natural chicken dog food recipe with limited ingredients. Super-convenient and easy-to-serve chicken dog food. Chicken, Ground Chicken Bone, Chicken Liver, Chicken Gizzard, Cantaloupe, Carrots, Broccoli, Lettuce, Egg, Ground Flaxseed, Inulin, Salmon Oil, Apple Cider Vinegar, Blueberry, Cranberry, Dried Kelp, Potassium Chloride, Sodium Chloride, Whole Ginger, Whole Parsley, Whole Garlic, Zinc Proteinate, Iron Proteinate, Vitamin E Supplement, Copper Proteinate, Manganese Proteinate, Mixed Tocopherols (as preservative), Vitamin D Supplement. The above feeding guidelines are approximate amounts for average daily meals. Individual dog requirements may vary from this chart based on age, environment and activity level. Adjust food as required to maintain optimal body condition and ask your veterinarian if you are unsure. Recommended meal frequency: twice daily. Divide portion by number of daily feedings. Crumble and feed as is or moisten with 1 tablespoon of warm water per patty and wait 3 – 5 minutes before serving. 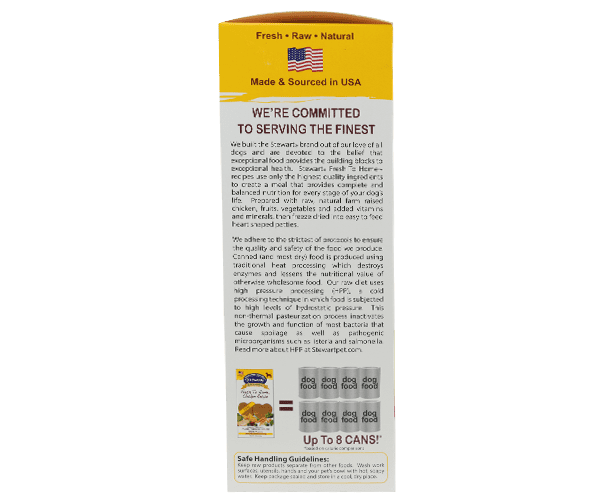 Resealable Pouch: 12 oz. & 24 oz. Our Raw Naturals freeze dried recipes are available in five other irresistible varieties. Click on each one to learn more.